Harper - you are ELEVEN MONTHS OLD!!!! You are completely on table food. No more baby food. You will just about eat anything and we are exploring new foods every day. You have even eaten "kids meals" at a few restaurants lately. You are still sleeping 12-13 hours at night - you usually get up once. And you take a good nap every morning. You go to bed really early - between 5:30 and 6 but you are always exhausted by then. You still have 8 teeth and I think you may be getting your molars. You are really drooling and holding your mouth lately. You love to hold your hands up in the "touchdown" sign when you stand by yourself. It's so funny! You talk and babble all the time. You say "hi", "dad-da" and "uh-oh" and that's about it. You are SO social. You want to look and talk to everyone you see. When we are at restaurants - you completely turn your body around to stare at whoever is sitting near us. It mortifies me sometimes. Thank goodness you are cute. ha! You like to play patty cake and peek a boo. You LOVE bath time. We call it "splish splash". You have started putting your face down in the water (and drinking). I think you will be a water baby. I can't wait to take you swimming this summer! I CAN NOT believe you will be a year old in a month. This has been the most amazing year of my life. I can't believe how much you have grown and changed over the last year. I wonder what you will be like at 2 years old and 5 years old and (gasp) thirteen! I know that no matter what I will love you with every thing inside me and you will always be the joy of my life. And no matter what you do or who you become I will be SO proud of you because I am your mother and you are the greatest thing that has ever happened to me! 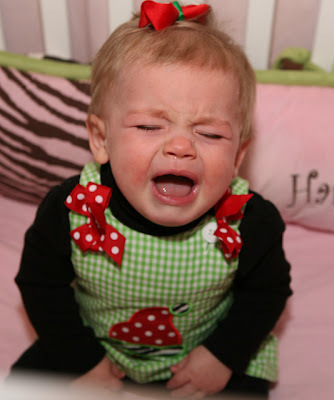 Love the picture of Harper crying..... she is a CUTIE! She gets more adorable every day! She is so sweet, I love all of her cute little outfits. Wow! Already?!?! Where has the time gone?? Thank you so much for sharing her with us!!! Such a sweet girl. I can't believe she is completely off baby food - wow! I am SO glad that bumper is in there for the pictures - they just wouldn't be the same without it. Oh, Kelly, you have such a beautiful daughter. She looks like such a delight. Praising God for His faithfulness to your family!!! Okay - so I was going to say she was "Precious" and realized that it wouldn't be very original given the 9 comments before me!! But, Sheh is completely and totally adorable and I'm SO happy that this year has been such a blessed one given her rocky entrance!! It's been a blessing to me to keep up with you all throughout this time and I'm truly thankful for it! Eleven months? How can this be? It has been such a joy to "watch" Harper grow this year. She is beyond Precious!!!! Happy Eleven Month birthday Harper!!!! You are so wise to write all of this down and also to realize how fast she is growing up! Turn around and they ARE 13...(but we don't age, right?) Have a great Christmas ~ she's the perfect age to be mesmerized by the box the toy comes in! My kids were! Your post made me almost cry. Harper is such a cutie...you are so blessed! Harper is so beautiful. Babies do grow so quickly. Beautiful post Kelly! What a sweet post! Eleven months already.. wow.. can't wait to see her birthday party posts next month!! Time has gone by so fast! Happy Wednesday! Its fun to see your Harper "how old she is" posts.. because my baby boy is just a month and a few weeks older then her.. they are growing up and doing the same things more or less. I love her crying pic in the crib. Funny too, I just blogged and posted a bunch of darling (I am his mom) pics. of my sweet boy walking and trying again....Have a great day Kelly! I have loved watching Harper grow. She is just two weeks older than my daughter (born Jan. 28), so it's fun to compare what they're doing (in a good way--I know comparisons can be dangerous!). My daughter doesn't say any words and only has her third tooth coming in, but she's been walking for a month! Funny how babies develop at different rates in different skills! Happy Eleven Month birthday Harper!!!! Ok, I cried! Great Post! That was absolutely precious! Made me teary!!! Sweet!!!!! Awww that post just gave me goosebumps and I think you just spoke for every mother that last sentence! Very well said, I sooo teared up a bit! Harper has grown soooo much! Kelly, this is the sweetest post! It literally brought tears to my eyes! These girls are growing up way too fast. Luckily, every day is a fun new adventure and that keeps us from being too sad about them growing up! Harper is as beautiful as ever! I know she is beautiful on the inside too just like her mommy! I wish our girls could hang out more! She just gets more and more adorable everyday. I just wish y'all were closer so I could meet the two of you! She's just precious and I love the "story" that she will always be able to share about God's precious hand on her life. She is such a gorgeous baby girl! That brought tears to my eyes! You are such a good mom and Harper is one precious little girl. She is lucky to have you as a mom!! She is beautiful!!! Happy 11 months! My son Lincoln who is 8 months today LOVES the amazon commercial too!!!! Beautiful girl! I love seeing the monthly recaps of Harper. I wish I had done something like that with my two kids! What a wonderful post! Your words to Harper brought tears to my eyes. Congratulations on such a beautiful little girl and she is so lucky to have a mom like you. i just recently started following your blog. my sweet girl was born january 2 so she and harper are very close in age! i have been doing the month by month pictures, too. time really flies doesn't it?! thank you for sharing your day to day and your sweet harper with us. i am excited to follow along. It's been so fun watching Harper grow up! She is so adorable!! I can't believe she'll be 1 next month!!! She will appreciate this when she is older :)! She is getting so big! This year has flown by! Goodness, she is so beautiful. It does go so fast; I cannot wait to see the what you've got planned for her first birthday! My one year old has the same cry face. What a cutie! Hope her 11 month birthday was great. WOW time has flown! She is so precious! I cant' believe how big she is getting! She's so cute, even when she cries!! She's so cute, I can't believe she's almost a year old! I cannot believe Harper is 11 months old! Every time I see a picture of her I thank God for His miracle working power! 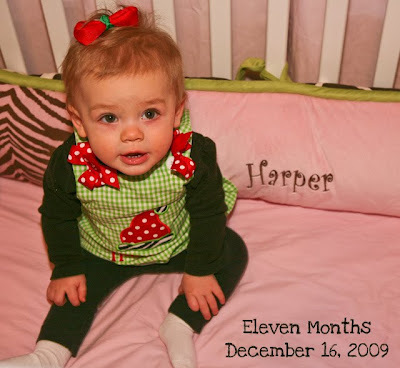 Happy 11th monthday, Harper! My little Katie Bug likes to drink the bath water, too. I have been taking a break from blogging and reading blogs lately, but I have missed seeing Harper's little face and of course her adorable bows and outfits. It is so hard to believe that she is 11 months old! I know you are cherishing every second. she is such a delight! and get ready momma, because it really does get more and more fun everyday!!! Goodness! I always thought Harper looked like a peanut - but she is 4 pounds bigger than my almost 15 month old twins! She is just so precious! So sweet watching her grow this past year. Thanks for sharing. Awhhh, just made me cry. That is so precious! Don't wonder too long- I've got one that's 13, and I promise you it happens in a blink of an eye- once they reach 2 years old the time absolutely flies. I love how proud you are of her. I hope you will always tell her that...I think you will! What a precious miracle baby she is! Happy 11 months sweet Harper!!!! oh my! she is so precious! That makes me tear up! Each day is truely precious...I have two that make me feel the way you feel & I know we are blessed! Oh my goodness....11 months! NO WAY!!! She is such a cutie! What an amazing gift from God she is! You are precious and so is she, Kelly! What an incredible 11 months:) So many blessings and thanks for sharing with all of us. This was such a touching blog! I wished I would have done a better job with keeping track of milestones for my kids. I really dropped the ball when they were babies and toddlers on this, but I did enjoy every second with them, so I guess we have many great memories in that respect. I was so overwhelmed with my husband in med. school and residency and we had no family help at all that I did not do a good job keeping a journal and doing milestones for my first two kids. I think you will be so glad you are writing this blog-it is really precious. Harper is precious and looks so happy. Music (piano) is one of those things I am so glad my kids have stuck with. It is the best money you will spend on any activity, especially if Harper is already showing an interest of giftedmess/passion in that area. When my son got to a certain point with his piano, the teacher advised us to get a baby grande. It has been so worth it! I am not a frivolous (sp? )person, but that is the best money we have ever spent. All of our kids bring blessings to others and glorify God through music - such a huge blessing and it just blesses your soul. It has taken hundreds of hours of practice and discipline, but so worth it. My baby girl will be 3 on January 16th. I can certainly understand how amazing it is to get so close to 1! Harper even looks a bit like Macie at that age. Love this so much. Two things came to mind...well more, but really, unless I start blogging, I have to limit myself...(1) perhaps Harper will not have to hide from people at Wal-Mart like we did...yeah, I realize you don't do this anymore, but I still do. (2) Thank goodness for technology b/c you would so be taking all of these pictures and making collages of them manually even if you couldn't do it with technology. I know you would. :-) Oh and I'll add a third b/c its just THE right thing to do...to God be the glory, Great Things HE Has Done. Love you guys so much. I'm all teary now! She's just beautiful! She is absolutely BEAUTIFUL!! Funny how you put, can't wait to see what you will be like when you are 2, 5! My oldest daughter turns 5 on January 19th!! Harper and Mara share birthday months! Mara is pretty much 4 years older than Harper and I can't believe she will be 5! She is a joy and she is more beautiful every day! Harper sounds a lot like what Mara was at that age! Time goes by soooo very fast and I know you have heard it a million times before, it goes WAY TOO FAST and enjoy every single moment that you can!! Have a VERY BLESSED CHRISTMAS AND HAPPY NEW YEAR!!! May GOD bless you more this next coming year with Harper than He already has!! I just wanted to tell you how cute the crying picture is. Her face is so scrunched up. She almost looks like she is singing, she is so in it. I kind of envy that! When you grow up, you can’t really cry like that anymore. Happy Eleven Months Miss Harper!! Boy, time flies. This year has been over in a heart beat. You will blink and she will be thirteen and shutting the door on you, and talking on the phone and flirting with Boys (!). What a glorious time you have ahead of you. Enjoy every minute. She will be grown before you know it. Happy 11 months, Harper! She has grown up so quickly! Harper has really grown up this month. So cute!